Callia Bincal, a Breton commoner, is taking refuge at Crestbridge Camp with her husband Aloys and her father Barthel little ways from their farm at Cropsford. It seems the farmers are having a little trouble with nearby goblins wrecking their new farms. She only has the clothes that she wears: a shirt with suspenders, a pair of green felt linens with rough leather shoes, and a small amount of gold. 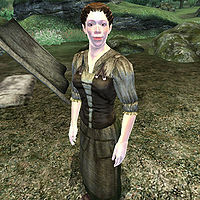 If you speak to Callia before speaking to her father, Barthel Gernand, she welcome you to the camp: "Welcome, traveller. We're all so worried about the goblins, we may not be as hospitable as we should be." If you speak to her after you've agreed to help them, she'll greet you by directing you towards her father for more information: "If it's about Cropsford, please talk to my father. He'll know what to do." Asking her about goblins will have her describe how they lost their home to the creatures: "Everything was going well. We had set up camp at Cropsford, and it looked like a beautiful spot. Then the goblins attacked. Thank Y'ffre that Mirisa was there! Without her, the goblins would have surely killed us all." Questioning her on the guide, Mirisa, will have her reply by saying: "My father hired her as a guide at an inn south of here. Good thing, too. She saved our lives, and led us safely back here after the goblin attack." Asking her about Cropsford will have her tell you about her father's dream to start a new life at Cropsford: "It was my father's dream, for us all to start a new life there. He spent everything he had to buy the land. Now it all seems to be ruined." Asking her about her father will have her answer your query by talking about his wish to have Cropsford built: "Barthel Gernand is my father. I'm worried about him. I think it will break his heart if we can't build Cropsford." Speaking to Callian Bincal about Cropsford after you've ended the goblin war, but before they've put up the first building in Cropsford, will have her thank you for giving them a chance to construct their new home: "I can't thank you enough for your help! You gave us another chance at a new life." Speaking to her about Cropsford after the first building goes up will have her say: "What do you think about our new home? It's smaller than our old house back in High Rock, but we built it with our own hands." Once the farm is finished construction, asking her about her new home will have her thank you for all you've done: "Our little farm is thriving. We couldn't have done it without your help. Come back and visit us anytime." Goblin Trouble: Stop a goblin war so a family can return to their farm. This page was last modified on 25 March 2018, at 02:45.